Research in the statistical analysis of extreme values has flourished over the past decade: new probability models, inference and data analysis techniques have been introduced; and new application areas have been explored. Statistics of Extremes comprehensively covers a wide range of models and application areas, including risk and insurance: a major area of interest and relevance to extreme value theory. Case studies are introduced providing a good balance of theory and application of each model discussed, incorporating many illustrated examples and plots of data. The last part of the book covers some interesting advanced topics, including time series, regression, multivariate and Bayesian modelling of extremes, the use of which has huge potential. 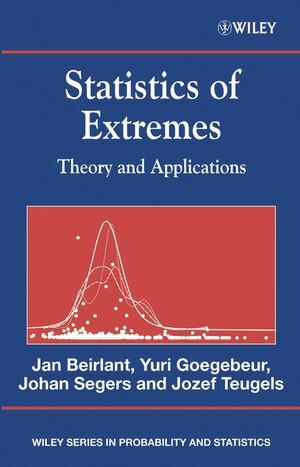 Jan Beirlant is the author of Statistics of Extremes: Theory and Applications, published by Wiley. Yuri Goegebeur is the author of Statistics of Extremes: Theory and Applications, published by Wiley. Johan Segers is the author of Statistics of Extremes: Theory and Applications, published by Wiley. Jozef L. Teugels is the author of Statistics of Extremes: Theory and Applications, published by Wiley. 1 WHY EXTREME VALUE THEORY? 1.1 A Simple Extreme Value Problem. 1.2 Graphical Tools for Data Analysis. 2 THE PROBABILISTIC SIDE OF EXTREME VALUE THEORY. 2.3 The Fr'echet-Pareto Case: ³ > 0. 2.4 The (Extremal) Weibull Case: ³ 0. 2.5 The Gumbel Case: ³ = 0. 2.6 Alternative Conditions for (C³ ). 2.7 Further on the Historical Approach. 3 AWAY FROM THE MAXIMUM. 3.2 Order Statistics Close to the Maximum. 4 TAIL ESTIMATION UNDER PARETO-TYPE MODELS. 4.4 A Representation for Log-spacings and Asymptotic Results. 4.6 Extreme Quantiles and Small Exceedance Probabilities. 4.7 Adaptive Selection of the Tail Sample Fraction. 5 TAIL ESTIMATION FOR ALL DOMAINS OF ATTRACTION. 5.1 The Method of Block Maxima. 5.2 Quantile View--Methods Based on (C³). 5.3 Tail Probability View--Peaks-Over-Threshold Method. 5.4 Estimators Based on an Exponential Regression Model. 5.5 Extreme Tail Probability, Large Quantile and Endpoint Estimation Using Threshold Methods. 5.6 Asymptotic Results Under (C³ )-(C*³ ). 5.8 Adaptive Selection of the Tail Sample Fraction. 6.2 The Secura Belgian Re Data. 7.2 The Method of Block Maxima. 7.3 The Quantile View--Methods Based on Exponential Regression Models. 7.4 The Tail Probability View--Peaks Over Threshold (POT) Method. 8 MULTIVARIATE EXTREME VALUE THEORY. 8.2 Multivariate Extreme Value Distributions. 8.3 The Domain of Attraction. 9 STATISTICS OF MULTIVARIATE EXTREMES. 9.4 Excesses over a Threshold. 10 EXTREMES OF STATIONARY TIME SERIES. 11 BAYESIAN METHODOLOGY IN EXTREME VALUE STATISTICS.